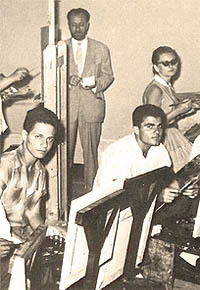 1956: Finishes his studies at the Academie and is awarded 1st prize at graduation. 1973: Awarded a medal at the Salon du Chesnay. 1975: Awarded 1st prize and the Gold Medal of the City of Nice. 1976: Awarded Gold Medal at the Salon du Chesnay. 1976: Submits three pieces to the Salon des Artistes Francais at the Grand Palais. All three are accepted and Pierre is awarded the Silver Medal and the Paul Liot Prize. 1977: Awarded 1st Grand Prix of Visitors to the Salon du Chesnay. 1979: Awarded the Gold Medal (permanent award) at the Salon des Artistes Francais, where Impressionist artists were refused in the late 19th century. 1981: Awarded the International Albrecht Durer Prize. 1985: Guest of Honor at the Salon du Chesnay. 1985: Honored Prize at the 'Salon de La Marine' in Paris, where he was invited by the Minister of Defense to spend two weeks painting on board a vessel of the French Marines.